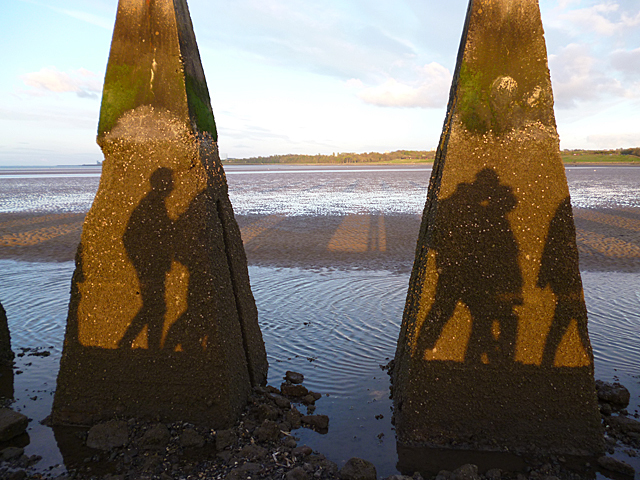 The setting sun is casting the shadows of people returning across the causeway from Cramond Island to the mainland. These concrete pyramids, much larger than the usual dragons' teeth, were erected alongside the causeway during the Second World War to prevent enemy boats coming through the gap between Cramond and Cramond Island. The vertical slots in the sides of the teeth supported concrete slabs. The teeth were originally only as high as the top of the slots, about 2 metres, but they were later increased in height to about 3 metres. The junctions of the old, lower teeth and the newer tops can easily be seen. A steel hawser was stretched along the tops of the teeth, which explains the slots in the apices. I confess to being rather surprised that such fortifications were considered necessary, because for about half the time there's no water at all, when there is it is shallow - even at high tide the water is only a few metres deep. This page has been viewed about 447 times.